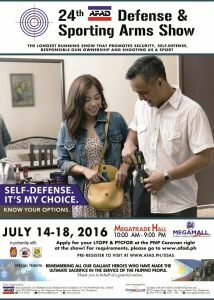 The long await 24th Defense & Sporting Arms Show is happening this July 14 to 18, 2016 at the SM Megatrade Hall, SM Megamall, Mandaluyong City. This show’s theme focuses on Self-Defense as a personal choice and this choice is better made when armed with the proper knowledge. The show’s organizer, the Association of Firearms & Ammunition Dealers of the Philippines, Inc. (AFAD) in partnership with the Philippine National Police, through the support services will be holding the LTOPF/PTCFOR caravan to provide would be buyers. existing licensed firearm owners & PTCFOR applicants to process their application in the comforts of a mall. The DSAS is also bringing back the free seminars available to all attending visitors which include the LTOPF education seminar, K-9 & various self defense demonstrations, etc. For more information and constant updates, please like the Defense & Sporting Arms Show Facebook page at: www.facebook.com/DefenseAndSportingArmsShow/. Avoid the long lines and take advantage of the dedicated pre-registered lane at the show by pre-registering at www.afad.ph/dsas.